Are Christians allowed to drink? What does the bible say about drinking alcohol? Watch this message or read the outline as Pastor James Greer dives into this topic. Distillation did not exist in Biblical times – there was no such thing as hard liquor. Beer did exist, but was not part of Jewish culture. Wine is the main alcohol in Jewish culture, so nearly all of the references to drinking refer to wine. Wine is referred to very positively as the best the land has to offer. An abundance of wine is part of the blessing that Jacob stole (Genesis. 27:28). The finest wine of the land was to be given the priests and Levites as a blessing for serving God (Numbers 18:12). As a promise for Israel’s faithfulness, ” God will love you and bless you with… new wine” (Deuteronomy 7:13). Fill my heart with joy when grain and new wine abound” (Psalm 4:7). Wine gladdens human hearts” (Psalm 104:15). Wine was used in the worship of God and at religious festivals. Melkizidek the Priest of the God most High blessed Abraham with wine. (Genesis 14:18). Wine was the drink offering given to God for sacrifice (Exodus 29:40) and many others. Wine was used to celebrate the Passover (and the Last Supper). (Luke 22:17-18). The Bible has many prohibitions about being drunk with wine. “Wine is a mocker” (Proverbs. 20:1). “Do not join those who drink too much wine” (Proverbs 23:20). “Do not get drunk on wine, which leads (to the ruin of your life) to debauchery” (Ephesians. 5:18). The Bible does say don’t be drunk. 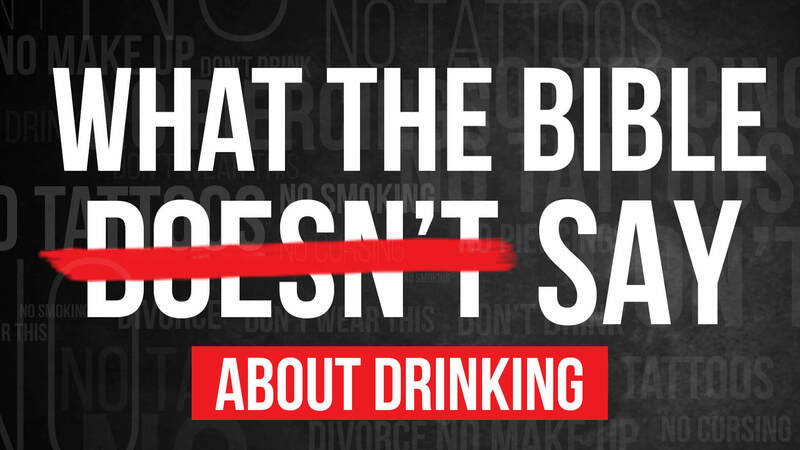 (Ephesians 5:18, NKJV) When you are drunk with wine you will say and do things that otherwise you would not do. (Proverbs 20:1, NCV; Proverbs 23:29-35, NCV)When you are filled with the Spirit you will say and do things you otherwise would not do. You don’t know if you are predisposing—for it to become a habit. The best thing to do is not drink at all. If you are under age it is not only a sin you are breaking the law. When you are under age, your brain is not fully developed, you make decisions based on emotions not facts or God’s Word. The Bible does not say you can’t drink. (Deuteronomy 14:24-26, NLT;Ecclesiastes 9:7, NLT; John 2:1-11, NCV) Make sure you have invited Jesus into your life and the events of your life. When you have a need, make sure you bring it to Jesus. Alcoholism affects people from all walks of life. According to the National Institute on Alcohol Abuse and Alcoholism (NIAAA), more than 80,000 people die from alcohol-related deaths each year in the United States. Drunk driving costs the United States $199 billion every year. Considering this information, we should not be passive or caviler about such a serious topic. The person who drinks should do so wisely and cautiously. When evaluating your stance on drinking, I think it wise to include all the possible ramifications. The person who drinks should in no way condemn those who have chosen to abstain. – Those who have chosen to abstain may have been guarding themselves from the pitfalls that often accompany drinking.